In February a very fun theme we have is Dinosaurs, so in our MWF class Room 204 we decided to dedicate a whole week to this fun theme and incorporate our letter of the week “D”. To introduce this theme, at morning meeting the students learned the strokes to write the letter “D”, as well as the sound, as they named many words starting with that that letter. They eventually discovered that the word “dinosaur” starts with D. They then wrote the letter “D” in their journals, wrote the word “Dog” and stamped a picture of a dog. They always get a sticker on their page for a job well done. There are dinosaur cookie cutters and molds at the play dough table. Classifying and sorting rubber dinosaurs by color or type using kid friendly chop sticks. We will read many fiction and non-fiction books about dinosaurs that will teach the names and characteristics of many types of dinosaurs. They will learn new vocabulary about the theme such as carnivore and herbivore. 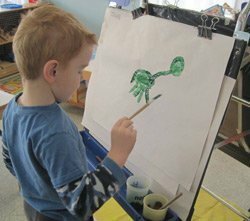 The children had many dinosaur art activities to stimulate their creativity. 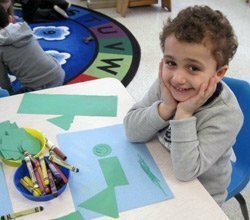 We love giving the children opportunities to use their own creativity and imagination by just giving them the tools they need and a theme without patterns or structured art projects. On the easel they were able to paint any dinosaur they chose or could even make up their own. 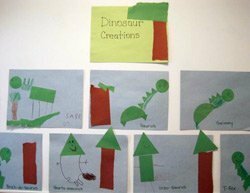 They also were given several shapes cut out of green paper and told to create a dinosaur using the shapes and incorporating a little bit of math for shape recognition. Using salt dough that kids will help make, we will make our own fossils by pressing a dinosaur shape into the dough and painting when dry. We love themes like this because the kids are genuinely interested and love to learn about these wonderful creatures. As you can see we are able to incorporate many concepts using this theme for children to learn. We have as much fun as they do!